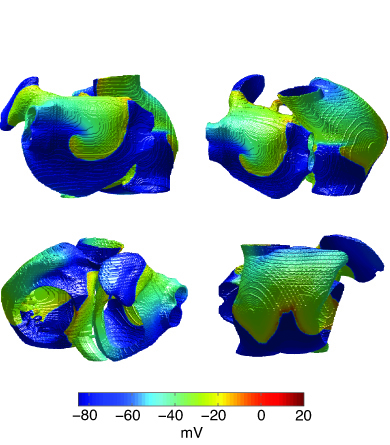 Different views of simulated atrial fibrillation in 3D model of the human atria. Atrial fibrillation is characterised by multiple excitation waves (seen as the yellow/green regions) that typically propagate as spiral waves or circulate anatomical obstacles such as valves and veins. Atrial fibrillation is an abnormal heart rhythm characterized by rapid and irregular activation of the upper chambers of the heart. Atrial fibrillation often shows a natural progression towards longer and more frequently occurring episodes and often occurs in patients with existing heart disease(s). Because atrial fibrillation is highly complex and evolves over time, it is very difficult and expensive to study comprehensively in experiments or in the clinic. Predictive multiscale computational modeling has the potential to fill this research void. We have incorporated many aspects of atrial fibrillation to model some of its various disease states. Our computational model consists of millions of virtual atrial cells coupled together to form a realistic three-dimensional atrial anatomy. Simulations of this model show that disease-like modifications to cellular processes, as well as to the coupling between cells, perpetuate simulated atrial fibrillation by accelerating the rhythm and/or increasing the number of circulating activation waves. We are continuously working to improve and expand the model to increase its predictive abilities and to yield more detailed mechanistic insights into atrial fibrillation. Our next steps also include simulation studies to predict the efficacy of pharmacological agents at controlling atrial fibrillation in the presence of common human ion-channel polymorphisms. “Mechanism Underlying Initiation of Paroxysmal Atrial Flutter/Atrial Fibrillation by Ectopic Foci: A Simulation Study.” Circulation. 115.16: 2094-2102. 2007.